I'm using Remote Desktop app on the full screen and when I get my mouse too close to the bottom of the screen (in orders to interact with remote system), the Dock is shown. The mouse pointer (annotated below) is not even close to the Dock edge or icons and the bar is already showing up. So there is no way I can access the bottom icons on the remote machine. How do I change Dock behaviour, so it's not so aggressive when it comes to appearing? Or disable it in the full-screen mode completely? System Preferences application allows you to change the behavior of the Dock. 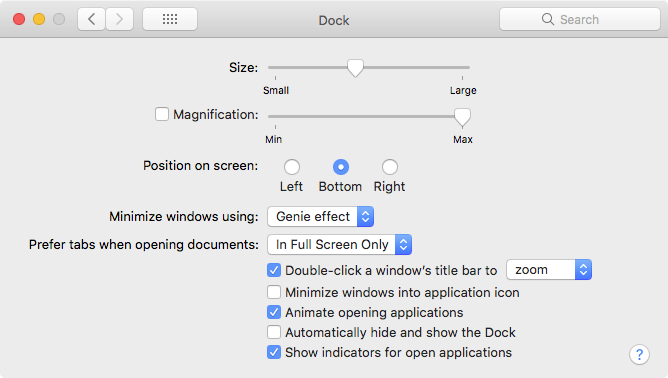 The Dock preferences pane is shown below. I would suggest moving the dock to the left or right side of the screen. Not the answer you're looking for? Browse other questions tagged sierra dock fullscreen . How do I show the Dock in full-screen mode? The Dock was moved to the right side of the screen but still auto displays when cursor on bottom?